Manus Province is the smallest province in Papua New Guinea with a land area of 2,100 km², but with more than 220,000 km² of water. The capital of the province is Lorengau and the total population is 60,485 (2011 census). The province is made up of the Admiralty Islands (a group of 18 islands in the Bismarck Archipelago), as well as Wuvulu Island and nearby atolls in the west, which collectively are referred to as the Western Islands. The largest island in the group is Manus Island where Lorengau and an Australian immigration detention centre are located. The primary industries are coconut and cocoa cultivation, and bêche-de-mer (sea cucumber) fishing. Among scuba divers, the Islands; particularly Bipi Island; have a reputation as a good diving destination with colorful marine life, coral reefs, shipwrecks, and clear water. Due to its population size, Manus Province only has two Members of Parliament, a Governor and an open member. Charlie Benjamin is the current Governor while his counterpart in the open seat is Job Pomat. Unlike most provinces in Papua New Guinea, general elections are usually peaceful and carried out efficiently on the Island. Traditional "Lapans" - village leaders, are also respected figures in the communities. Soccer and touch rugby are among the most common outdoor sports played in the province. Rugby League, Union, basketball, volleyball and netball are gaining popularity in on the Island. Due to the lack of proper sporting facilities, most talented sportsmen and women find it hard to make it on the national scenes. However, the introduction of the PNG Grassrooots Games has helped expose some of these hidden talents. The archipelago became a German protectorate in 1880 and an Australian mandate in 1920. During World War II the archipelago was occupied by the Japanese who established a small base in April 1942 near the village of Rossun on Manus Island. They also built the first landing strip entirely by manpower at the eastern Point of Los Negros Island in Momote. On 29 February 1944 during World War II, the Admiralty Islands were invaded in Operation Brewer led by American General Douglas MacArthur. The Americans quickly built a big base at Seeadler Harbor, including harbour, wharves and an airbase, which became an important base for the further war operations in New Guinea as well as on the Philippines. The base is today used by the PNG Defence Force. It was made famous by the work there and writing of it by the New York anthropologist Margaret Mead from the 1950s through '70s. 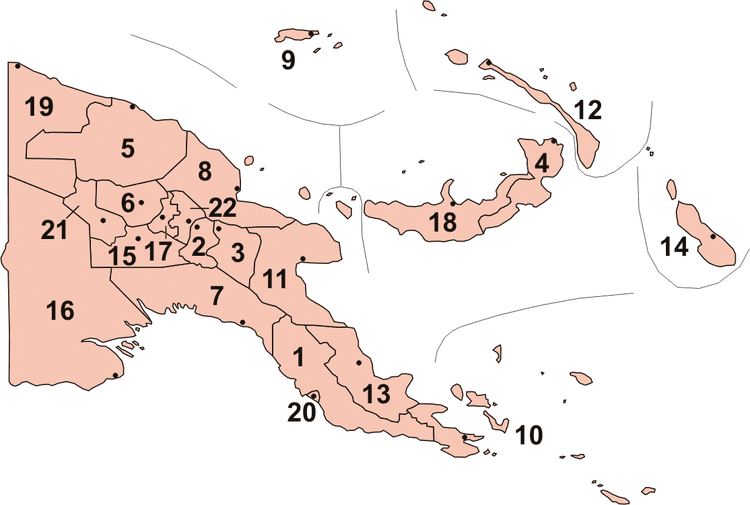 Manus Province has a single district, which contains one urban (Lorengau) and eleven rural Local Level Government (LLG) areas. For census purposes, the LLG areas are subdivided into wards and those into census units.